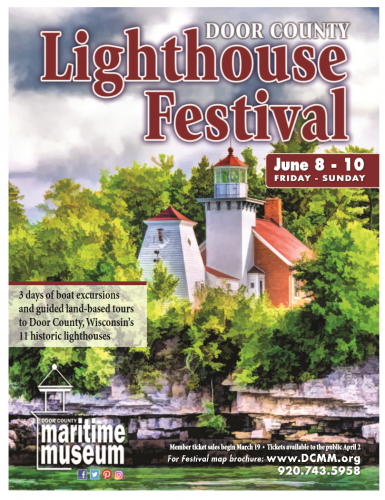 Tickets for the 25th Annual Door County Lighthouse Festival go on sale to the general public Monday, April 2, following a two-week pre-sale for museum members. Many of the boat excursions are unique to the Lighthouse Festival weekend. Following the successful members-only pre-sale, a few of the lighthouse tours are almost sold out but ample tickets remain for a variety of land-based tours and boat excursions set for the weekend of June 8-10. Tickets can be obtained online on the museum’s website, www.dcmm.org, by calling the museum at (920)743-5958 or stopping in the museum in Sturgeon Bay at 120 N. Madison Avenue.